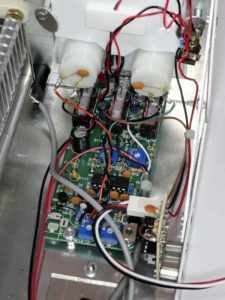 a run on timer which automatically runs the fan when RF is detected by the existing meter circuitry, and runs the fan on for 5 minutes to help cool down the coil. If the objective is to keep exit air well below the critical point for plastic insulation, at 40° ambient, a 40° rise can be accommodated. 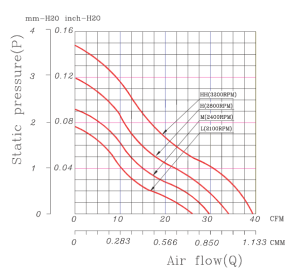 Above, the performance curves for the Ceramica 80x25mm FAN8025C12HH model fan. 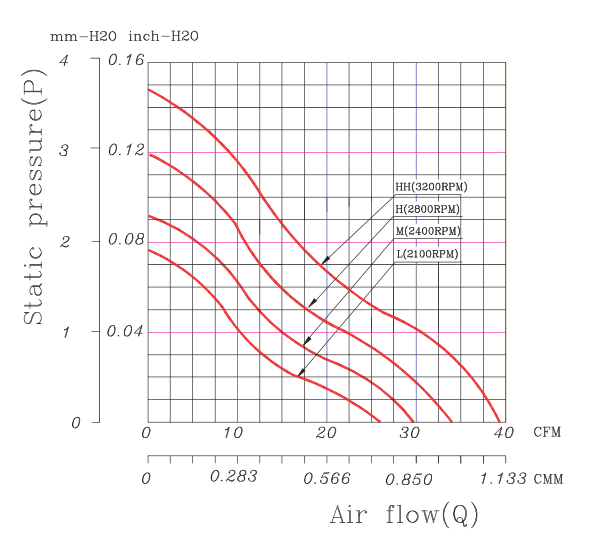 The specifications for the fan on 12V are for 18.8l/s (1.13m^3/min) flow with zero head, and in this application air flow is measured at 14l/s (0.84m^3/min) at 700m altitude. Assuming specific heat of dry air is 1kJ/kg and density 1.225kg/m^3, 14l/s raised 40K requires 0.014*1.225*1*40kJ/s=686W (which is about 17W/° in round numbers). The fan provides a substantial capacity to remove heat from the ATU. Above, holes were cut to accommodate the 80mm fan on the left side of the case and a similar exhaust hole on the right side. Finger guards cover both case openings. A run on timer is used to automatically run the fan when RF is present, and to run on for 5 minutes. 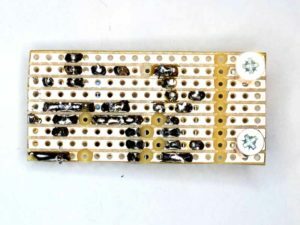 The run on timer is described at A generic run on timer using an ATTINY25. 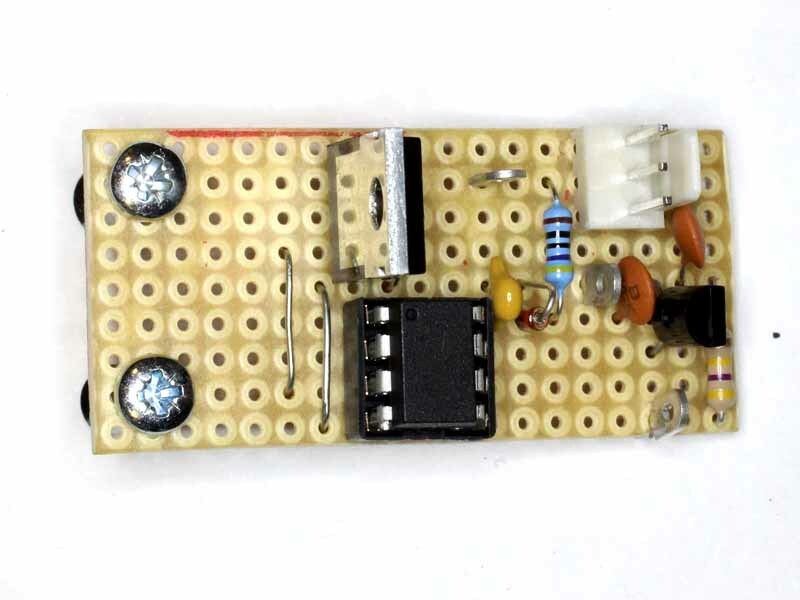 Above, the run on timer is assembled on a small piece of Veroboard. 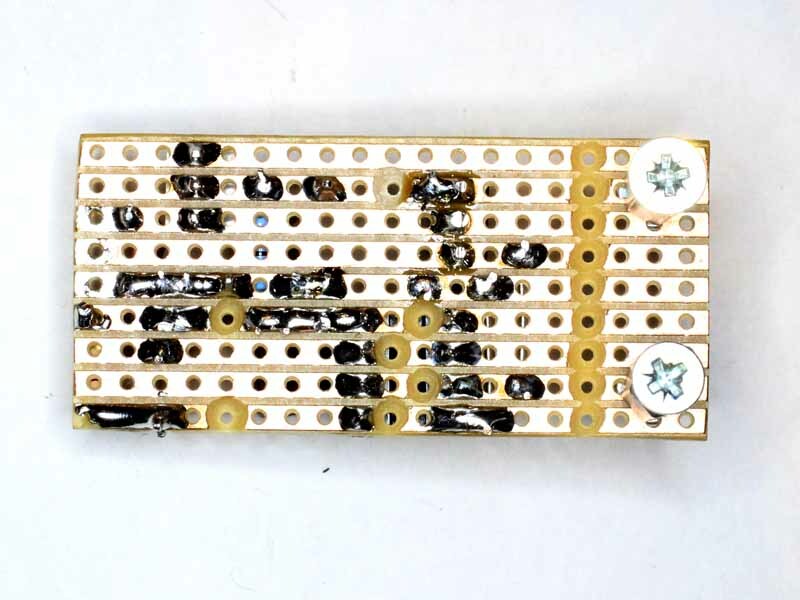 The original fan connector plugs onto the three pin connector at upper right, ground, 12V and input connect to the Vero pins on the board. This variant uses an IRF510 for higher current capability. Above, the board mounted to the chassis lip clear of the high RF intensity parts. The +12V and ground are obtained from two lugs for the meter lighting, and signal from the rear left Peak switch (as seen in this view with the brown wire). 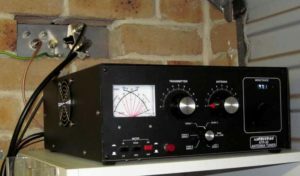 The MCU uses the watchdog timer at about 120kHz for a clock to minimise harmonics and RF noise (since it is housed inside the ATU cabinet). The processor is put into idle mode whenever possible which further reduces radio noise. No noise due to the microcontroller has been observed on any HF bands. 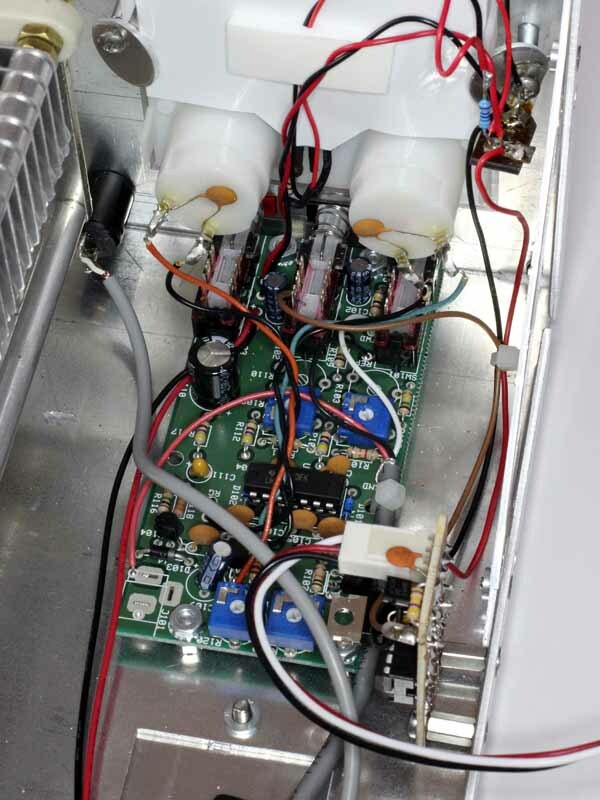 The circuit triggered on less than 5W input, at lower inputs supplementary cooling is not needed.